Earlier in June, I went on a float trip with Albemarle Angler. Despite the tough conditions, I had a fantastic time, and caught some great fish. Last time, the conditions weren’t right for topwater, so I booked another trip with hopes we’d have some better luck. After all, there’s no better fishing than topwater. I had such a great time with Scott on the last trip, I called Albemarle Anglerback up and scheduled another trip with him. Luckily, we were met with much better conditions this time. It was a bit overcast with a light sprinkle every now and again, the water was fairly clear, and the flow was on the lower side. There was a new challenge for Scott this time though – I brought my girlfriend, Susanna, along with us. Susanna had been fly fishing only a couple times before with about a year spanning the last time she even picked up a fly rod. Scott was up to the task, though. Scott sat Susanna in the front of the boat and pushed us off. Scott had tied on a streamer for me, and a small popper on Susanna’s line to make casting a little easier. Scott reminded Susanna of the basics of her cast and made sure she was able to get the line out. With both of us getting flies in the water, the trip was on. A few minutes downstream, I’m working my streamer along some cover, just itching to feel that bump on the end of the line. Suddenly, I hear Scott say “Here it comes… OK, SET IT!” Confused, I looked at my fly and didn’t see anything. That’s when I turned my head to see Susanna’s rod doubled over, with about a 18″+ smallmouth attached to the other end. Scott walked her through the fight, and she managed to keep the line tight. Not only was this the first fish of the day, this was Susanna’s first fish that wasn’t a sunfish. The fish made a last ditch effort at the side of the boat as Scott went to net it, and evaded the mesh. Susanna brought it the fish back to the boatside, and Scott made another attempt at putting it in the net. Unfortunately, the fish had just a little bit of fight left in him, and managed to toss the hook as Scott swooped in. The smallmouth swam free, narrowly evading the horrors of a brief photo shoot. Not too much later, Susanna hooks into a rock bass and a sunfish while Scott had me continuing to try some streamers. At that point, Scott decided topwater was where it was at today, and switched me over to a gurgler. Soon after, I was on my first smallmouth. It didn’t have the size of Susanna’s, but was still as fun fight. 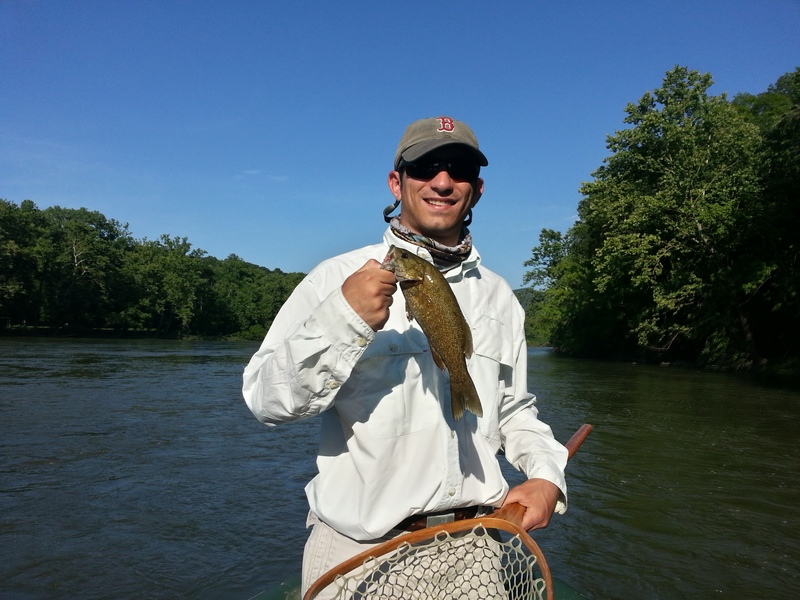 We continued to see great action on smallmouths for most of the morning. Quite the difference a great guide can make – Susanna went from hardly being able to cast to consistently catching smallmouths in a matter of a couple hours. In the midst of all the smallmouth action, Scott floated us past some slow water with lots of cover that just screamed largemouth bass habitat. The Shenandoah has some BIG largemouth hiding in it, and I figured I’d try to pull one out of it. I laid out a nice, long cast with the green gurgler. I gave it a quick strip to make some commotion, and waited for a few seconds. I gave it another rip, and the fly made the perfect splashing action. Another pause. I watched a mouth devour the foam and fur, and set the hook. “Just an average largemouth,” I thought… until the fish made a run. I realized I had a nice one on the end of the line. The bass gave me a few shoulder leans and tried running for the cover. My Orvis Helios 2 had the backbone to turn him, but I started getting a little worried if my 3X tippet would withstand the stretching. I let him have a little line back before coercing him to the boat. Scott netted him up, and I admired the nice 20″ – 22″ largemouth sitting in the next. This fish wasn’t only long, he was fat. Scott snapped a few pictures of me and the quarry, and we let the fish swim back off into his home. I’m sure the fish let out a huge sigh of relief, but it unquestionably wasn’t as big as my sigh of relief. “At least this fish was bigger than Susanna’s,” I said to myself. We kept on fishing, with the bite starting to slow a little as the sun started coming out. Even still, we continued getting nice reactions from the average size (12″-16″) smallmouths and some giant sunfish. We stopped on a beach for a great lunch. Scott brought along some fantastic sandwiches from a deli near Charlottesville. After scarfing them down, we continued our day. The afternoon bite was a bit slower than the morning, although we had pockets of frenzied activity. I was still hoping for a trophy smallmouth of my own. The 16″ fish sure are fun – heck so are the 12″ fish – but bigger is definitely better. Hopefully the big fish would cooperate like his younger cousins had been. The fish were so eager to bite, I even had one fish come at my fly three separate times after I pulled the fly out of its mouth the first two times. All this pointed to a good shot at a big guy. By late afternoon, we were drifting past a bank with a nice grass patch along the edge. Scott had me casting up to it to try to coerce a fish to bite. No luck. Scott had a feeling about that section though, and rowed us back up stream to do one more float past it. I laid out my cast, popped the gurgler, and just as I was about to pick up and throw again, a flash of bronze engulfed the fly. At first I thought it was another average sized smallie, but the fish quickly set me straight with one heck of a run. The battle continued as the bronzeback put my 7wt to work. A few jumps and several hard runs later, the fish came boatside, and Scott swooped in with the net. This fish wasn’t quite as big as the largemouth, but it fought a heck of a lot harder. It even rivaled the size of the fish Susanna lost at the boat. We took a few more fish to the boat through the rest of the afternoon, but nothing else that rivaled the size of our earlier fish. 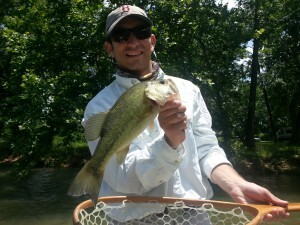 Nonetheless, Scott once again proved his ability to put his clients on fish consistently. This time, the topper was proving he can do it with inexperienced fishermen (and fisherwomen! ), too. 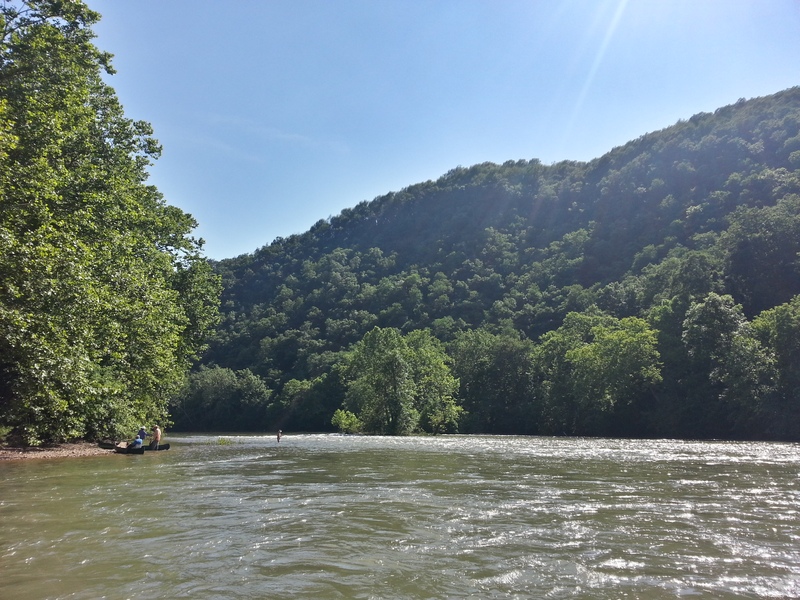 This summer has been pretty busy, so when I realized I had a spare weekend day to hit the water, all I wanted to do was head out to the Shenandoah Valley and catch some fish. I started calling up some guides, and luckily, despite only having about a week’s notice, Scott from Albemarle Angler was available for a full day trip this past Saturday. As the trout season was dwindling down, Scott suggested we do a smallmouth float – which was fine by me since Smallies are one of my favorite fish to catch, period. We decided on a several mile stretch right out of Shenandoah, VA. In the days before the trip, I started getting a little nervous. A big storm was supposed to roll through Thursday, and I began suspecting the river would get blown out. Luckily, it tracked just far enough to have a minimal impact on the water levels. Scott called me the day before the trip for finalize details, and he said the water would be high, but fish-able. Disaster averted. I met up with Scott at the boat launch and discovered the water had a bit more color than we were expecting. We didn’t think we’d have crystal clear water (and frankly, didn’t really want it), but the water had maybe about a foot of visibility. Yikes. It looked like I was going to have a challenging day ahead of me. We got our rods rigged up – two with floating lines, and one with a sinker – and Scott pushed us off and down the river. The morning was tough. We threw almost everything in our collective fly boxes and couldn’t get so much as a strike. We tried clousers, worms, hellgramites, hogsuckers, small flies, big flies, purple flies, black flies, green flies… and the fish just plain ignored it. Or didn’t see the fly. It was a rough first few hours, but at least I was outside and relaxing. The morning grew older, and I still hadn’t gotten a strike. Trying to find something that would work, Scott found a nice feeder creek, and anchored us up at the confluence. It had everything we could want – clearer water, an eddy, and some dead water too. Scott pointed out exactly where to toss my fly, but my luck still didn’t change. We spent a good 10 minutes on this spot changing out flies, but I just couldn’t convince the fish I’d give them another day to live if they just bit my fly. Scott was certain this was the spot though. He picked up his rod, rigged up with a Kreelex, and tossed it out as well to double our odds and find what the fish were biting. A couple casts later, and he connects! He quickly hands the rod over to me, and I pull in a BIG sunfish. It wasn’t a smallmouth, but at least we got the skunk off the boat. He tells me to keep fishing that fly now that we got a bite. I make my next cast, and WHAM! Another hit – this one a lot stronger. After a nice battle, Scott netted a great size largemouth bass! We kept on that spot for another 20 minutes or so. I ended up connecting with our first smallmouth of the trip, and a second one shortly thereafter. We left the confluence shortly after I nailed another big sunfish. Armed with our knowledge of the recipe for success, we moved on for some new water. 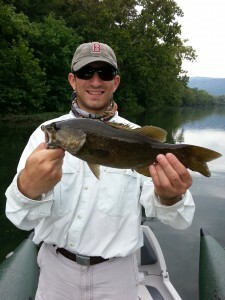 It wasn’t too long before I felt that tug and set the hook on another smallmouth. This guy struggled, danced, and tried to jump his way off the hook, but he was no match for us. A few photo ops, and he was off to swim another day. I was really hoping he’d tell his buddies to come play. Scott and I started to feel our stomachs grumble a bit, so we pulled over for lunch – which was included in the cost of the trip. Scott brought the coolers on shore broke out some chips, and opened the cooler. I expected something nice and simple, like a deli sandwich. Next thing I know, Scott is breaking out a portable gas grill! The menu was not ham sandwiches today. We were talking gourmet, freshly grilled burgers topped with cheese, bacon, sauteed onions and sauteed mushrooms on ciabatta! It tasted just as great as it sounds, too. Normally, I wouldn’t even write a sentence about the lunch on a one-day fishing trip, let alone a whole paragraph, but I felt it was important. It can often be difficult to differentiate good guide services from great ones, or great ones from the best – but to me, such a specialized touch makes it tough to parallel. Sorry, Scott, hopefully I didn’t set the bar too high for you for the future! After lunch, we set off for more battles. We kept the Kreelex on the line, and that kept the smallmouths on the line. Scott did great work constantly picking out the eddies and pockets he wanted me to fish. Each time, I would drop a fly in and get a hit. Scott even put up with me occasionally casting into the trees. He’d dutifully row the boat over for me to free up my fly. Of course, I would always pick my opportunity to get the fly caught up when we were in the fastest water and it was toughest for Scott to row. Our fears of a slow day turned into Scott commenting on the great numbers we put up – at least for the conditions. I didn’t really count, but I would guess we had at least 15 smallies to the raft by the end of the float. Add those on to several bruiser sunfish and the largemouth, and it was plenty to keep me entertained! I had a great experience with Scott. He has quite the fishing background having spent a significant time both out west and in the Shenandoah area. I’m already determined to get out with Scott and Albemarle Angler for another float this summer, and am looking forward to giving them a try when the trout start biting again. 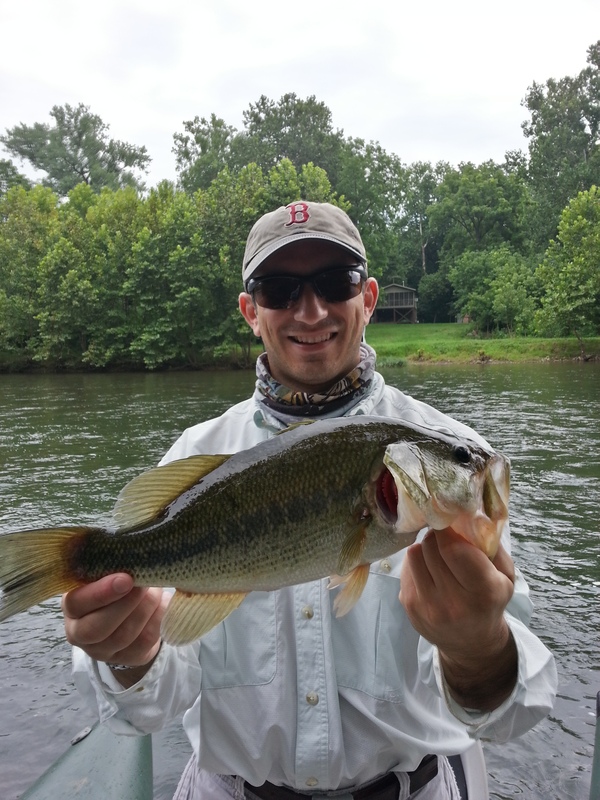 Ready to book with Albemarle Angler? Be sure to leave a review if you try them out! They can be reached at albemarleangler@gmail.com via email or by phone at (434) 977-6882. Rates for a full day floats are $350 including lunch, and wading trips start at $225 for a half day. Albemarle Angler targets smallmouth bass from mid-March through mid-October, and trout (brook, brown, rainbow, and tiger trout!) from mid-September to mid-June depending on water flows. They fish the Shenandoah and James Rivers for smallmouths, and various rivers, streams, and creeks (including some private water) for trout. Albemarle Angler is also a full service fly shop located at 1129 Emmet St, Charlottesville, Virginia, 22903. As if all that wasn’t enough, they also coordinate fly fishing trips across the globe. 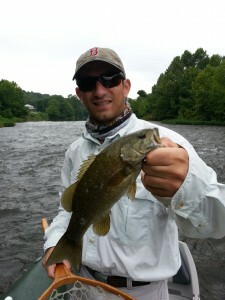 A few weeks ago, I did a smallmouth bass float trip with CT Campbell of Page Valley Fly Fishing. 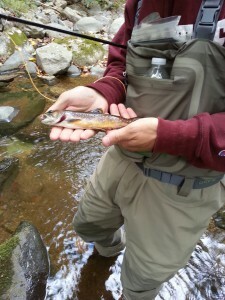 I was so impressed with his friendliness and skill as a guide, I decided to look him up again to go on a trip for wild brook trout in the Shenandoah mountains. The Shenandoahs haven’t received a lot of rain lately, so many of the brook trout streams had very low water levels. CT decided our best bet was the Rapidan. I met up with CT around 9 AM (the great thing about brook trout is they aren’t very active early in the morning, so you get to sleep in! 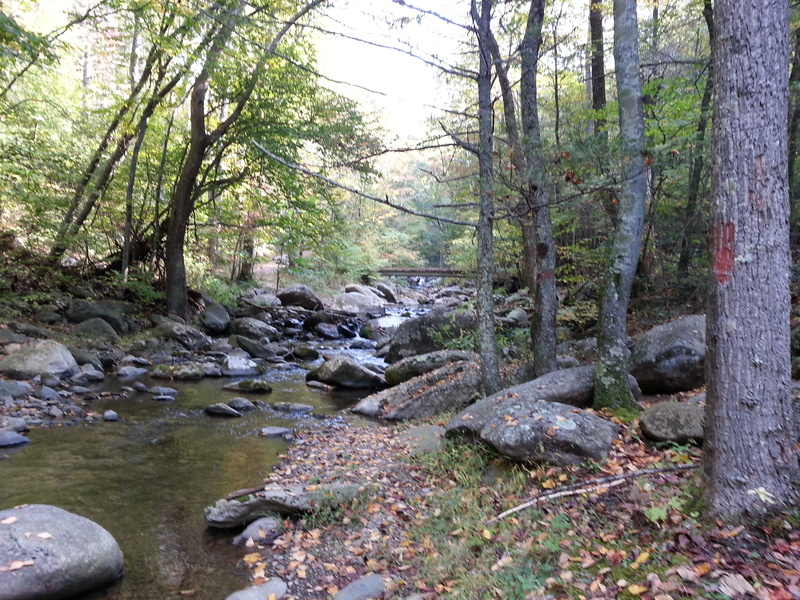 ), and he took me into the Shenandoah National Park. With his previous experience as a back-country ranger in the area, he pointed out different landmarks, features, and even environmental challenges the forest is having during our ascent up the mountain in his truck. We got to our fishing spot, geared up – CT uses 3 and 4 weight fly rods for these mountain streams. CT brought me to the edge of the river to review the tactics we’d be using for this trip. Looking at the stream, I had my doubts there were even fish there – the stream was hardly more than a trickle with constant “waterfalls” between pools. The biggest pool wasn’t more than about 15 feet wide and 30 feet long, and that was rare. CT assured me that the fish were there. As if on cue, I spot a brook trout holding under a tree limb in the pool CT was using to explain our tactics. From our perch on the rock about 15 feet above the pool, we could see it was pretty good size – about 10 inches. 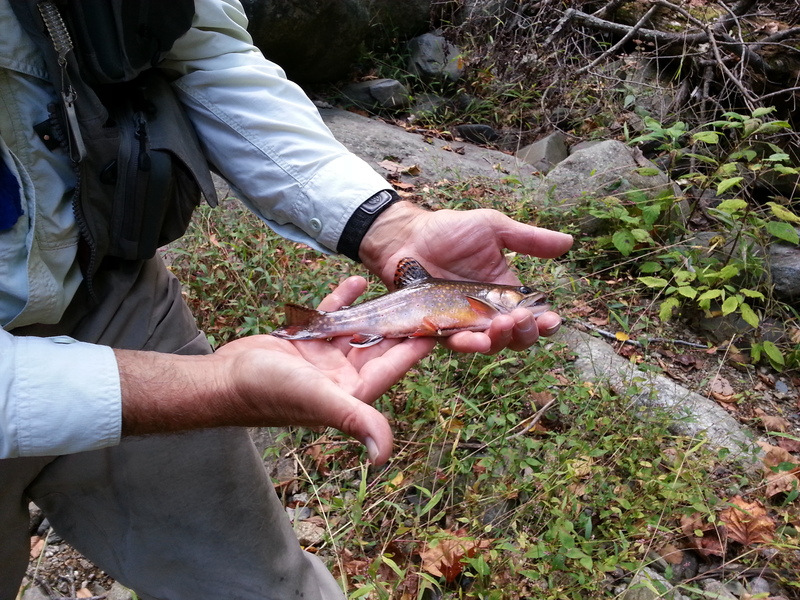 Fishing for these brook trout isn’t about catching a big fish. It’s catching a beautiful, wily, native fish. It’s actually pretty challenging fishing too, especially with the water so clear and levels so low. These fish are very spooky! Seeing the first brookie, we sneak our way down to the tail of the pool to try to entice the fish to take our fly without spooking him first. CT tied on a Royal Wulff onto some 6x tippet. I strip out some line and make my first cast and…. BOOM! I catch the tree behind me. In the excitement, I forgot I was fishing a tight mountain stream rather than a open river. CT frees my line, and I cast again, this time paying attention to the trees behind me. My first cast was slightly off target and missed the drift I needed. For a lot of these fish, casting 6 inches to the right puts the fly out of it’s feeding path. My second cast was right on target, but I let it drag. No bite. My third cast was to the same spot. This time, no drag. 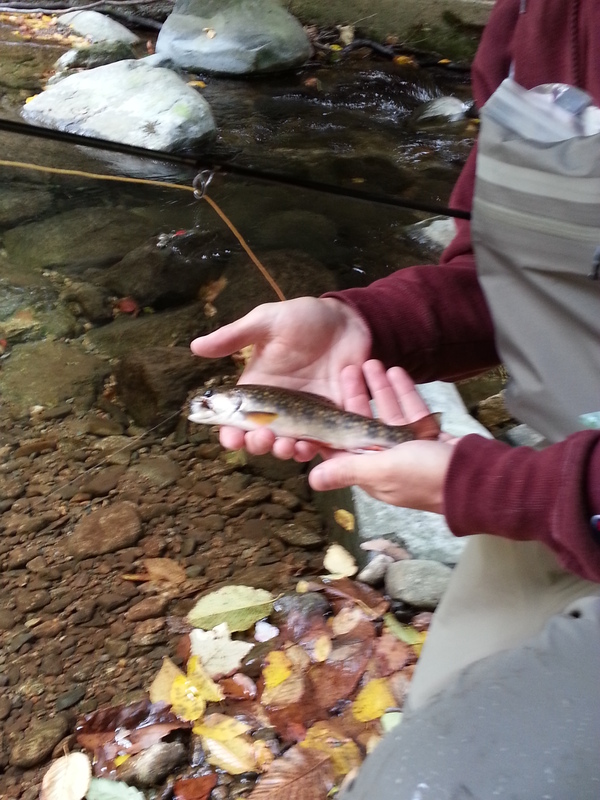 Seconds later, the brookie came up and slammed the fly! I watched in awe. Unfortunately, watching was all I did, and I didn’t set the hook. Luckily, I fared a bit better on the next pool and actually reacted to the strike. A beautiful 8 inch brook trout took my fly. The next several pools elicited a few missed strikes and a couple “young of the year” brookies (brook trout that were born this past February and are only a couple inches). CT was getting a little confused, and thought the pools were fishing a little weird. We tried a couple other dry flies, but had the same results. Finally, CT figured it out. He noticed a wet spot on top of a rock that wouldn’t be exposed to the running water, and it hadn’t rained recently. Sure enough, we found fresh footprints – someone was fishing right ahead of us. We packed it in, and moved a ways upstream. CT was right – at our next spot, it took me two casts before I hooked another 8 inch brookie. The day continued on with lots more strikes and more hooked fish. It was a double digit day for me (without counting the young of the year), with 4 solid fish over 8 inches, and quite a few more 4-6 inch fish. If you’ve never fished for native brook trout, it is a must-do experience for the fly fisherman. The scenery alone is enough to make one want to take the trip, let alone the beauty of the fish. 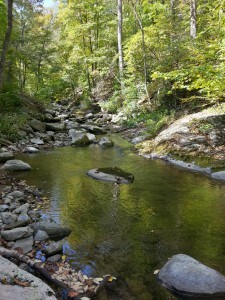 You’ll see unspoiled nature, peaceful streams, and lots of wildlife. If you make the trip in the fall, you get the added bonus of seeing the leaves change colors, plus the brook trout will be even more beautiful with their spawning colors! Ready to book a trip with C.T. Campbell / Page Valley Fly Fishing? You can contact C.T. via email at marcycampbell@embarqmail.com or call him at (540) 743-7952. Visit his website at www.pagevalleyflyfishing.com for more information. C.T. offers full day smallmouth float trips plus full and half day wade trips for either smallmouths or brook trout. His 2012 rates begin at $150 for a half day wading trip. Quite a deal for such a skilled guide! 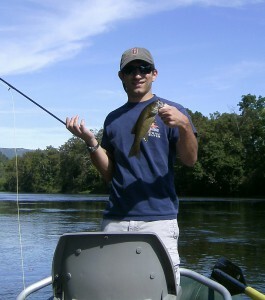 I caught the itch a little while ago for some smallmouth bass fishing. I had caught plenty of smallmouth bass from ponds and lakes, but had never really targeted them in rivers. 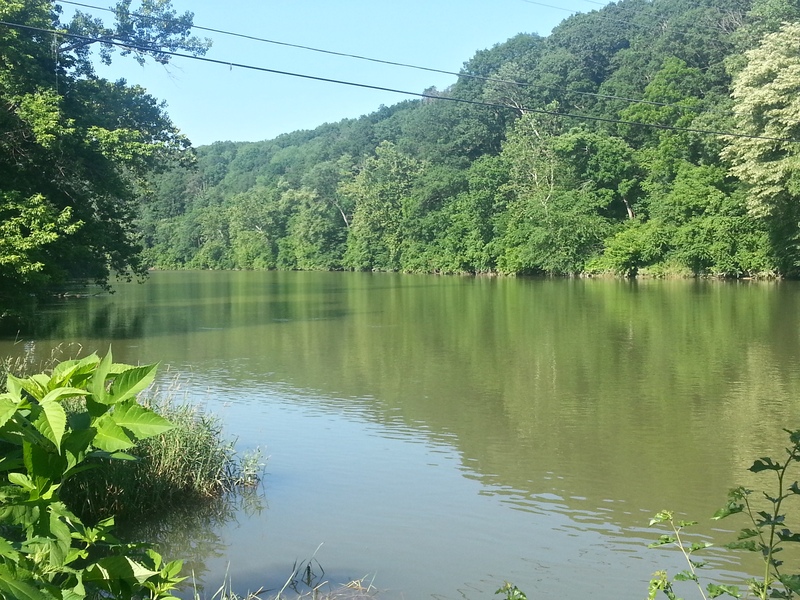 The Shenandoah River is well known for its smallmouth bass fishery, so I figured there was no better place to start. 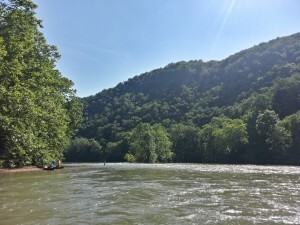 I booked a full day float trip on the South Fork of the Shenandoah with C.T. 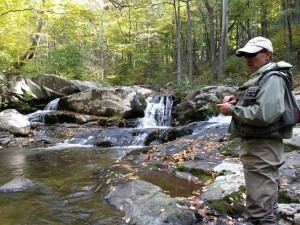 Campbell of Page Valley Fly Fishing for this past Saturday to get my line wet. C.T. is a retired back country ranger who now operates a guide service based out of his hometown of Luray, Virginia. He’s been guiding for 15 years, and has a great knowledge of the local rivers and area – and it sure shows in his in depth knowledge of the river. Even his boat is ideal for the river. 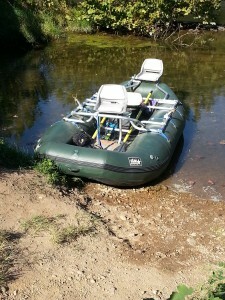 It’s a big, self bailing inflatable craft that comfortably seats two anglers. The seats swivel 360 degrees so you’re always able to get yourself into position. The front seat also has a platform on which you can stand and fish. Even after 8 hours on the river, I never got wet, felt fatigued (from the boat, anyway) or uncomfortable. We were blessed with an absolutely gorgeous day. Mid-high 70’s and sunny all day. Unfortunately, the sunny conditions combined crystal clear water made for a technically difficult day of fishing. We soon found out the fish would be incredibly spooky and we’d need to make minimum 30-40 foot casts to avoid spooking the bass. We saw tons of fish, including some pretty big ones, but with water clarity letting us see the bottom in 10-15 feet of water, the fish would tend to see us first. If that didn’t alone scare them, the motion of the cast or the fly line landing anywhere nearby sure would. In the morning, we started with some poppers on the surface. Regardless of how “fishy” a section looked, we couldn’t even get a smallmouth to follow a fly if it was in the sun. The shade line was where the fish were biting, so we stuck to anywhere we could find some shade. 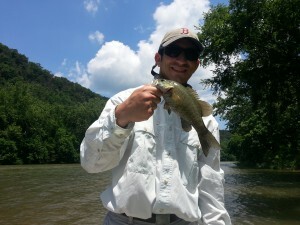 We were catching a few smallmouths mixed in with tons of sunfish – or as C.T. 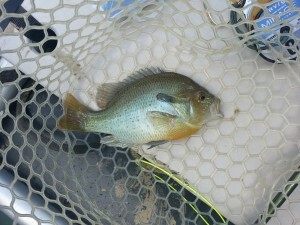 calls them, “Fish Tacos.” While the sunfish are fun, they weren’t what we were after. We were abiding by the “big fly, big fish” theory in hopes to avoid some of the sunfish, but that seemed to attract only the big sunfish. Not the worst problem in the world! With the smallies seeming to be a little slow on the bite, we switched over to some streamers. My second cast with an olive and white clouser elicited a vicious bite from a smallmouth. A few casts later and BAM! 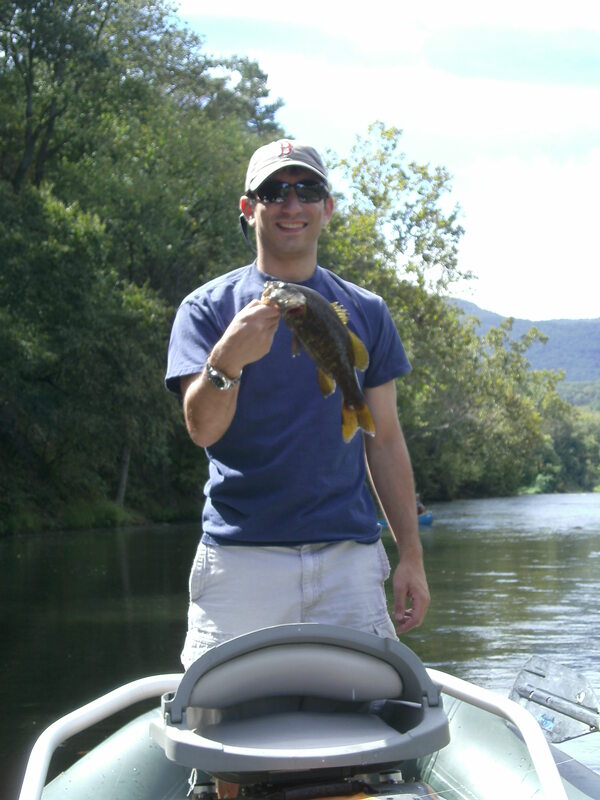 Another smallmouth. The clouser was getting plenty of strikes from the smallmouths, but still couldn’t draw anything out from anywhere sunny. At this point, we broke for lunch. C.T. brought us lunch on the river, and we made our own sandwiches, snacked on some chips, and followed it up with his wife’s phenomenal homemade brownies. C.T. includes all this on his full day float trips, along with plenty of water and gatorade. Being a environmentally conscious guide, C.T. ensured all the trash we brought in was taken out. After lunch, one of the first sections we hit was where C.T. knew there would be some big fish. It was a deep cut right along the edge of a river where it runs against a cliff. He tied on one of his local favorites, a “Magnum Hog Sucker,” and told me he was guaranteeing I’d catch a fish on it in that cut. Sure enough, I got hit and there was his promised fish. Smallmouths are known for their strength and great fight, especially compared to their bigger Largemouth cousins. If you’re used to fishing for smallies in lakes, what you may not realize is how much stronger the ones that live in rivers fight. This guy we picked off from the deep cut was no exception. The bite in the shade stayed consisted for the next 30 minutes or so, when suddenly the fish turned on in the sun. Nearly every cast to anything “fishy” looking would at least produce a follow, if not a strike. I had long ago stopped counting how many smallmouths I had caught, and the fishing was faster than ever. Every place C.T. would tell me to cast would bring us a fish. This continued on until the sun was low in the sky. The bite slowed a little, but I slowed even more. The last hour still produced plenty of strikes, but my reflexes slowed down too much to get a good hookset on anything. The day’s catch totaled well over 30 smallmouth bass with plenty in the 12+ inch range, close to as many sunfish, and a nice largemouth bass. We also spotted several big catfish – probably 20-30 pounds – along with a few large carp. As if the fishing isn’t enough to make a run down the Shenandoah, the wildlife and scenery is a bonus. There are gorgeous views everywhere, and we saw tons of great blue herons, hawks, and even a bald eagle. There was even a raccoon cleaning himself off in front of his riverfront hole. The worst part about the trip is how desperately it makes me want to go back out. With the season winding down, it’s going to be tough to sneak in one final trip!